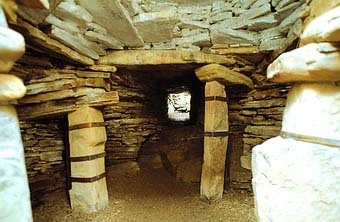 In Orkney, underground cellars are known as 'earth-houses'. They consist essentially of a gently sloping passage and an oval underground chamber. The earth-house at Rennibister was discovered on 12 November 1926, when part of the farmyard subsided beneath the wheels of a steam thresher. After the thresher was pulled out, the site was examined. The passage had to be cleared because it was blocked with black earth mixed with shells, clearly some ancient domestic rubbish. The chamber was relatively clear, apart from its bottom, which was water-logged. The oval chamber measures 3.5 x 2.5m (12 x 18ft), and there are five recesses built into the dry-stone walls. The corbelled roof was supported by four freestanding slab pillars; now there is a hatch and ladder allowing entry to the chamber. A mysterious aspect of Rennibister is the discovery of disarticulated remains of six adults and twelve children of various ages. There are no artefacts to give any clue to the date of the bones. It is unusual to find such human remains in earth-houses, but since they were thoroughly mixed, they must have been placed in the chamber as bones rather than as bodies. It is worth noting that Rennibister lies beneath the yard of a modern farm: a good example of the re-use over the centuries of a good location.